OS grid reference SD 55612 33622. 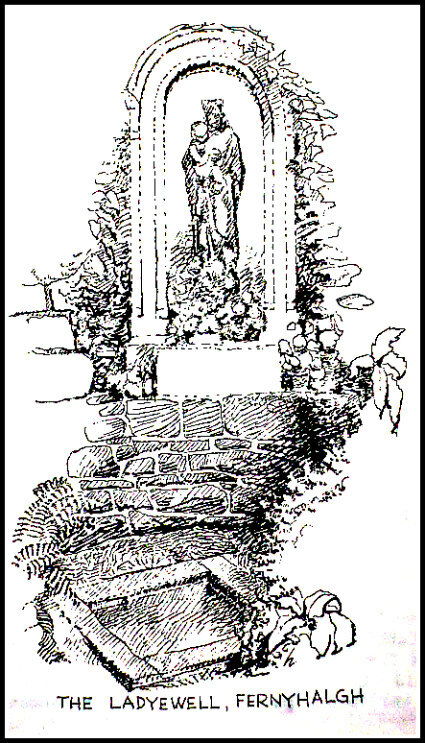 Our Lady’s Well (Ladye Well) at Fernyhalgh can be reached along a narrow country lane (Fernyhalgh Lane) to the east of the A6 and M6 motorway, some 4 miles north of Preston. Fernyhalgh is a hamlet situated between the villages of Broughton and Grimsargh, with pleasent countryside on all sides. The holy well of Our Lady is in the garden of the 17th century Ladywell House which houses a Roman Catholic chapel and retreat centre. It is located at the side of the secluded Fernyhalgh Lane that runs south for about ½ a mile from D’Urton Lane. The entrance to the well and shrine is through a little gate almost hidden at the side of the retreat centre building. There was a chapel on this site way back in 1348 and possibly a shrine dating back to the 11th century. The spring itself is obviously a Christian one, with it’s dedication to Our Lady – the Blessed Virgin Mary, and possibly a pre-Christian spring. According to the legend, in about 1471 a merchant sailing across the Irish sea was caught in a terrible storm; afraid that he was going to drown he prayed to the Virgin Mary and vowed that if his life was saved he would undertake some work of devotion to Her. Soon the storm cleared and he found himself washed-up but safe on the Lancashire coast, but he had no idea where he was. At that moment a heavenly voice spoke to him and told him to find a place called Fernyhalgh and there build a chapel at a spot where a crab-apple tree grew – the fruit of which had no cores, and where a spring would be found. He began to search around for this sacred place but no-matter how much he tried he could not find it. The merchant found lodgings in Preston and, was about to give up altogether, when he overheard a serving girl at the inn. She started to explain why she was so late on arrival. She went on to say that she had had to chase her stray cow all the way to Fernyhalgh. The merchant asked her if she could take him to this place. In a short time he discovered the apple tree with fruit bearing no cores and beneath it a spring and also a lost statue of the Virgin and child. He set about building a chapel close by in memory of Our Lady and soon pilgrims were visiting the holy well and receiving miracles of healing. However, during the time of persecutions in the reign of King Henry VIII and through to that of King Edward VI the well was abandoned and left derelict, and the chapel itself was sadly demolished. The holy well of Our Lady was, however, fully restored in the late 17th century and a new chapel (the Martyrs Chapel) was built in 1685 when persecutions towards Catholics had eased. Again the place became a place of pilgrimage and many miraculous cures were being recorded there. The chapel (which is upstairs in Ladywell House) was used by religious sisters as a place of retreat and is still used today; it houses some of the relics of the English Catholic martyrs. Today, it is a renowned Roman Catholic pilgrimage centre and Marian Shrine, with thousands of visitors coming from far and wide. 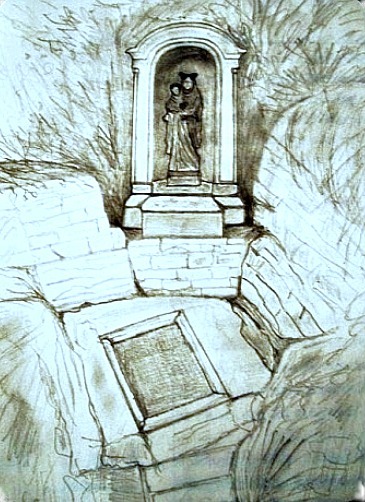 The holy well stands within a rectangular enclosure with steps descending down; the well itself being a small square-shaped basin overlooked by a statue in a stone-niched surround of the Virgin Mary holding baby Jesus. The well and shrine were restored to what we see today between 1905-1954 by the religious sisters, and it is still very well cared for by volunteers in the local Catholic community, with flowers usually adorning the well-shrine during the Summer months. Coins are sometimes thrown into the well although ‘it is not’ regarded as a “wishing well”. Visitors are always welcome and, you don’t have to be a Catholic, everybody regardless of what religious persuasion they might be can visit the well and shrine. Bord, Janet & Colin – Sacred Waters, Paladin Books, 1986. Popham, Edward, J., (assisted by Margaret Panikkar), The Osbaldeston Saga, 1988. With illustrations by Andrew Henderson. Popham, Edward, J., Where Shall We Go In The Ribble Valley, The Salford Catholic Truth Society, 1993. Fields, Ken, The Mysterious North, Countryside Publications, 1987. With thanks also to The Northern Antiquarian. Categories: Holy Wells / Springs, Our Lady's Well at Fernyhalgh in Lancashire | Tags: Our Lady's Well at Fernyhalgh in Lancashire | Permalink.